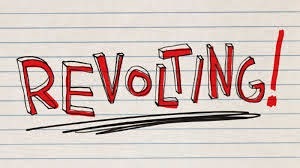 The Three Rs: Rants, Raves and (Occasional) Reflections: We're Revolting--More So Than Usual! Those of you who follow the blogs of my partner in crime, William Kendall or know him from Facebook already know that he's in Facebook Jail. If you don't already know what that means, Facebook Jail is a suspension for any variety of offenses that leaves the user unable to post, like or comment on the site. The details of how this came about are on his own blog. Anything posted online can lead to misunderstandings. I've had a problem with my Facebook author page. It was originally named Beishir Books, the label I chose as my self-publishing "publisher." Collin even designed a pretty cool logo for the paperback editions. The problem is that it has prompted some aspiring authors to query me, looking to get published with Beishir Books! The latest came a few days ago. I received a message via Facebook that made no sense to me. I'm guessing it was a translation issue. I asked the sender to clarify. She wanted to know if I was accepting submissions for an anthology. I did a double take on my page. Did I post something that looked like I was an actual publisher seeking submissions? No. Did I mention doing an anthology? No. 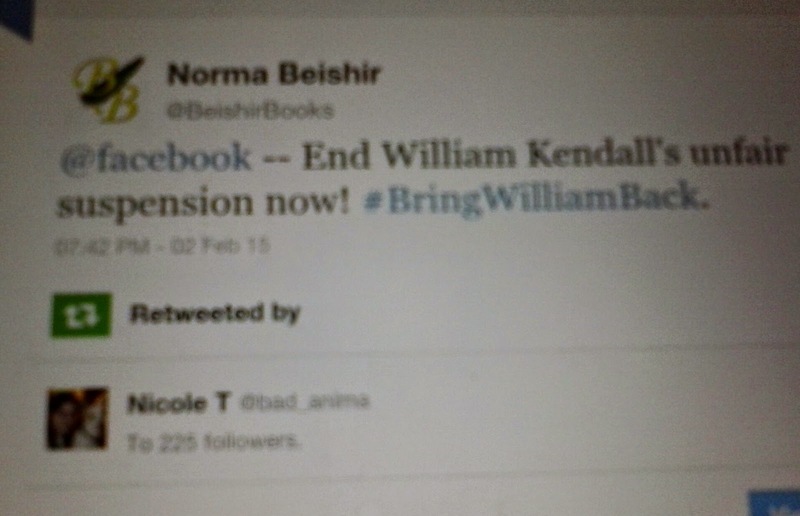 So...would everybody reading this (except you spammers--you just go away) please join our campaign to bring William back to Facebook? The more people who make noise, the more likely we are to get results. Thanks! 2/6/15 Update: I received an email from friend/fellow author/blogger Shelly Arkon. She, too, has been suspended by Facebook, while another Facebook author friend, Cassandra Jones, has been continually harassed on her page by a woman Facebook refuses to suspend. Censorship at work? Sure sounds like it. At any rate, they can't silence us unless we allow it. I've posted for William and now for Shelly in their absence. If I'm suspended, I'll get Collin to post for me. We'll say what we need to say one way or another. If I ever do an anthology, I'd only do it with friends, so you'd be on the list! I find myself wondering what the story is with that other poster and this other William. Still no idea if Facebook's going to bother setting this right anytime soon, but I'm not optimistic. I think somebody saw our hashtag and thought one of us was looking for a boyfriend who'd gone astray! Facebook is being ridiculous. There are other sites we can migrate to. A lot of young people left Facebook because their parents were hanging out there! So sorry to hear about this mess. Glad I don't do FB because I tell ya, it sounds like a real cluster muck. It can be a real PITA, Ivy! It is a mess! By the way, Norma, my short stories are Twisted, but most make people laugh. So----if there is ever an anthology, remember me. No, I'm not holding my breath. What is it with Facebook? Maybe we should think seríously about doing this...a WMD anthology maybe? A shame there's no viable alternative to FB. Yet. Actually Google + is gaining on them. I've been active there for a while and really like it. Yes, you can. You can go into the settings for your account and click on Delete. It's pretty easy. You know, Grace, I think you're onto something. 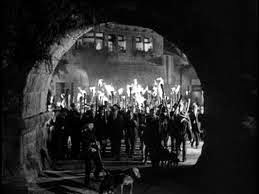 In the physical world, there would be a protest march--or a union would strike. In the cyberworld, we have to use other options. As it happens, there is a way to TEMPORARILY disable our Facebook accounts. If we can convince enough Facebookers to join us, we could shut down for a week, two weeks, whatever is needed. We could post on our blogs, Twitter accounts, Google +, anywhere we normally post, what we're doing and why. I've been reading about some of the absurd reasons Facebook and Twitter accounts can be suspended. Maybe it's time to make some noise. I feel so bad for William! Hope freedom comes soon;). Very crappy situation. It's really unfair that a seven-day suspension is now approaching two weeks. Hopefully the dopes at facebook get over themselves, or remember that William has been left out in the cold, in the facebook doghouse. I've no idea how to get into trouble there myself. I try my best to stay out of trouble... but I manage to screw up once in a while. Hoping for the whole thing to end. Usually, I'm the troublemaker. It amazes me that in the years I've been there, I've never been suspended even once! Hmmm...Revolting Writers. That could be a good title!